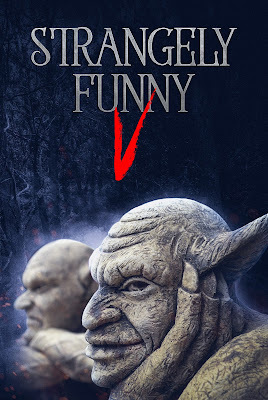 Stories I Found in the Closet: STRANGELY FUNNY V NOW AVAILABLE! Tick Tock: A Stitch in Crime is still chugging along strong, but I was surprised last night to discover that the other anthology featuring one of my stories, STRANGELY FUNNY V, is now available at Amazon! I knew the publisher, Mystery & Horror, wanted to get it out before the end of May, but since I only saw the galleys last week I didn't think it was going to happen. But here they giving the people what they want and have clamoured for: More side-splitting stories of horror and weirdness! The sixth book in the Strangely Funny series. You have all heard tales of the phantom hitchhiker, but what about her parents? How do they feel after a few decades of boys showing up on their doorstep looking for their jackets? Take this journey with us and find out what club the Devil use for a short putt. Discover where werewolves retire when their muzzles turn gray. Open the pages of Strangely Funny V and join authors Eldon Litchfield, Dan Foley, Juliet Boyd, and many more, as they explore the strange happenings that could be in your neighborhood. My contribution to the anthology is "The New Job," a story about an under-funded and under-staffed city department responsible for the extermination of "exotic supernatural pests." And by pests we of course mean ghosts. Hilarity and gore ensues. Currently only the Kindle version is up on Amazon but the paperback should follow soon. Keep your eyes peeled!